In this tutorial, we'll see how to make an animated cursor from a filmstrip image in one simple procedure. A filmstrip is an image file containing several images placed next to each other. Each image is one frame of an animation. 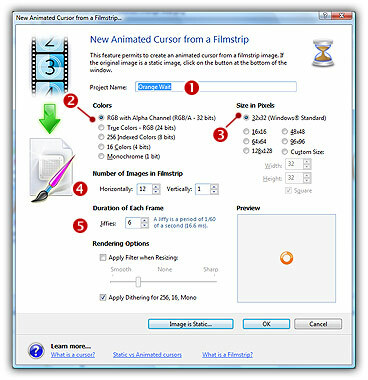 Filmstrips are just images so they can be saved using any image file formats such as BMP, GIF, JPEG 2000, JPEG and more. 1. Choose "File/Open", browse your folders and select your filmstrip file (Windows® standard dialog box). Choose "File/New/File Browser" or press Ctrl+Alt+O. 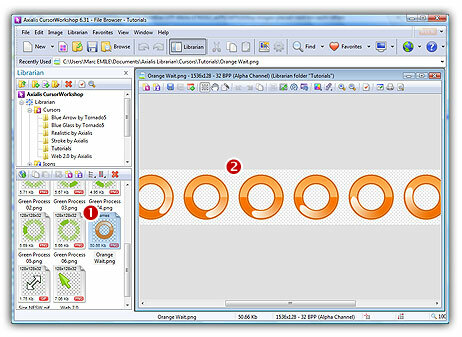 A built-in Axialis File Browser window opens. Browse your disks, see the thumbnail preview and double-click the filmstrip file you wish to open. In the Recently Used zone (in the main toolbar), type the full pathname of the filmstrip file you wish to open then hit Enter. 3. If your filmstrip is opaque, you can create transparent areas. Using the following tutorial, you can easily transform the white background to transparency: Add Transparency to an Opaque Image. 7. In the Project Name group ( ), enter the cursor project name. Do not specify any extension. 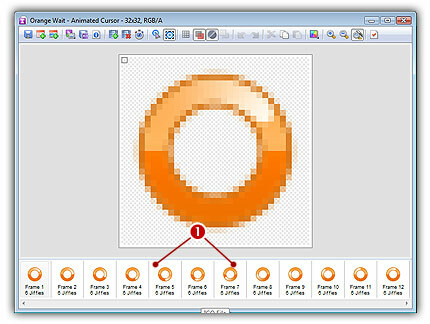 In Colors ( ) and Size ( ) groups, select the format of the animated cursor. To read more about the cursor specifications see What is a cursor topic. We recommend 32x32 RGB with Alpga Channel. 8. In Number of Images in Filmstrip ( ), enter the number of frame images present horizontally and vertically in the filmstrip. Normally CursorWorkshop detects the correct values. If this is not the case, enter the correct value manually. The preview image will update accordingly.